David Powers King: Frozen: A Winter Wonderland Of Music and Laughter Amidst A Conveniently Executed - But Fun - Story! 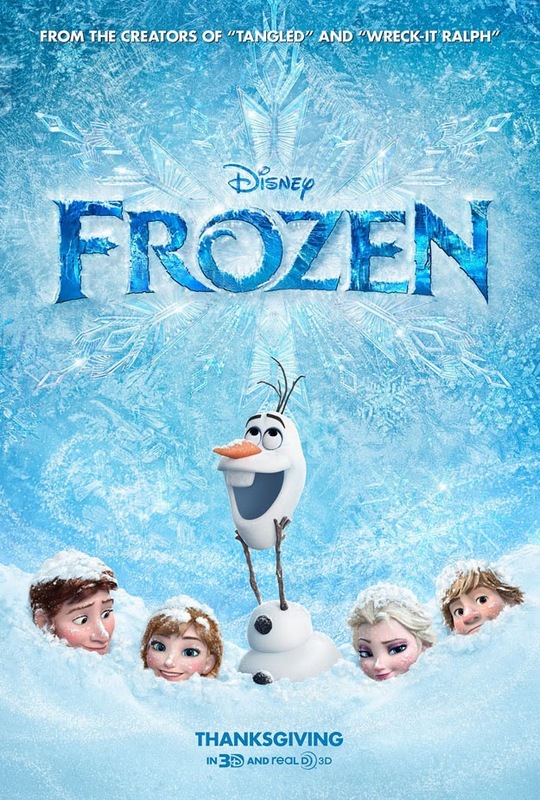 Frozen: A Winter Wonderland Of Music and Laughter Amidst A Conveniently Executed - But Fun - Story! My all-time favorite tale from the works of Hans Christian Anderson (surprisingly enough) is The Snow Queen - a story about the strength of friendship and a boy and girl who overcome the evil mischief and cold that is set upon them. It has its own quirky charm, so it's no surprise that creative license would come into play for a big screen adaptation of the majestic ice monger. In fact, it's expected. Tangled had a similar dilemma, but the new Disney retelling of the stolen girl locked away in a tower was so masterfully done, I couldn't help but anticipate what this team would do with this chilly tale. In the place of a troubled friendship comes a seemingly untouched dynamic and theme in all of animated films: sisterhood - a great focus for a story, even if the events leading up to the end are a tad too easy. It's funny, stunning, and whimsical enough to melt the most Frozen of hearts, but it's a little too safe and seems content on settling its conflicts with convenience. Anna and Elsa used to be the closest of sisters, the best of friends, until a layer of frost covered their royal relationship. It's not until Elsa's coronation as Queen of Arendelle that she unveils her "Frozen" secret. Fearful of bringing harm to Anna and her people, Elsa banishes herself to an icy wasteland. In the meantime, an eternal winter has fallen upon the land. If something isn't done soon, everybody will freeze to death. It's up to Anna (with the help of an ice cutter and a talking snowman) to restore her sister's love and bring warmth back to the world and into their hearts. Previous Disney adventures are famous for their melodic melodies, an aspect of Frozen that did not disappoint. The songs are fun, a bit popish, but belted with gusto and a fair number of well-executed duets. The winter effects are visually brilliant, from blizzards to snowy enchantments, right down to the formation of the queen's majestic palace of ice. Keeping to its original Danish setting, the film pays a worthy tribute to its cultural look and appeal. There's no doubt that the cast is well-placed. Kristen Bell's voice entertains, complimented by the talents of Idina Menzel. There's also plenty of humor; witty one-liners are sure to be quoted around the Thanksgiving table. Frozen is loaded with surprises and fun for the whole family. What ultimately fumbles this fable is the overall execution of story. It starts great. The potential is there for dynamic character arcs, but the few conflicts that spring up along the journey do little to build up or encourage the characters to learn and grow. You're cursed by a spell? No problem! I just happened to be raised by magical friends. Need to quickly wrap things up? There's a big storm outside, but hey, let's all convene on the frozen bay - protagonists, antagonists, sidekicks ... Who needs to go to Disney on Ice after seeing this movie? Aside from the sisters, there's scant chemistry, making it a chore to get behind the supporting characters. The cold and calculated wisdom that the snow queen is famous for has been reduced to a fearful young girl who could've discovered the answer to her problem long ago. To say Frozen is a worthy holiday adventure that the whole family can enjoy is a given, but is it the best animated film since Beauty and the Beast, as some have claimed? I'm going to disagree, but that doesn't mean it's not an enjoyable addition to the volumes of Disneyfied fairy tales. If the themes were deeper, and character morals went a step further, than I'd want to build a snowman. Have you seen this chilly rendition of The Snow Queen? What's your take on it? What's your favorite story by Hans Christian Anderson? I'm David, and "Let's ... Bring ... Back ... Summer!" It certainly isn't the classic they touted. Not even epic. But a lot of fun. They probably could've done more with it, as the film felt a little short. Fortunately the humor was spot on and it did have a very sweet and gentle feel to. I'm going to see this tomorrow! I'm excited. I was very wary about Tangled, but ended up loving it so much that I'm optimistic about Frozen. I loved this movie. I think I may have been anticipating it for so long that I would have loved it even if it was horrible, if that makes sense. It certainly wasn't flawless, but it was a lot of fun! My daughter wants a FROZEN themed birthday party and hasn't even seen the movie yet. I'm surprising my kids today after school and taking them. Great review. I think we'll all enjoy it. I did enjoy Frozen. Very much. But I do agree that it felt a little 'safe'. And they weren't able to take the initial tension and keep increasing it throughout. I haven't seen it and probably won't at the theatre. I appreciate your review of this movie! I hope to have a chance to take my kids to it, but I'm not sure, yet, if that's gonna work out. I enjoyed the movie. Not more than Tangled - my favourite Disney movie - but as you said, it was fun and the animation was really well done. It was fun to have a sister story, but I too felt more could have been done with the characters. A fun story though, over all. Lots of movies by Disney have convenient or happier endings. Remember the ending of the original Little Mermaid story? Yup, sea foam.The Little Mermaid, Beauty and the Beast and The Lion King will always be animated movie juggernauts other Disney movies will be compared to. All Disney can do is make more animated movies and hope one day they'll make one again that rises to the level of these past classics. I haven't seen Frozen yet but I plan to. Thanks for sharing David. I saw this movie with my sister and enjoyed it a lot. Needless to say, the sister dynamic was my favorite part. (Elsa and Anna's relationship reminded me a lot of the one I have with my own sister.) The song placement was a little uneven, and I didn't care for The Twist--if they were going to go that route, they should have at least explored it better--but still, I thought the movie was amazing. I already want to see it again! Very interested to see the sisters together. I loved Brave b/c of the mother/daughter relationship that was showcased in it, so hopefully Frozen will be a plus for me. And animated is always such a treat! HI David - sounds like one of those fun movies that we can see time and again .. I'm sure I'll enjoy it - though expect it'll be via the tv in due time ..